We put the fun back in fitness by offering a different philosophy and approach than other gyms. 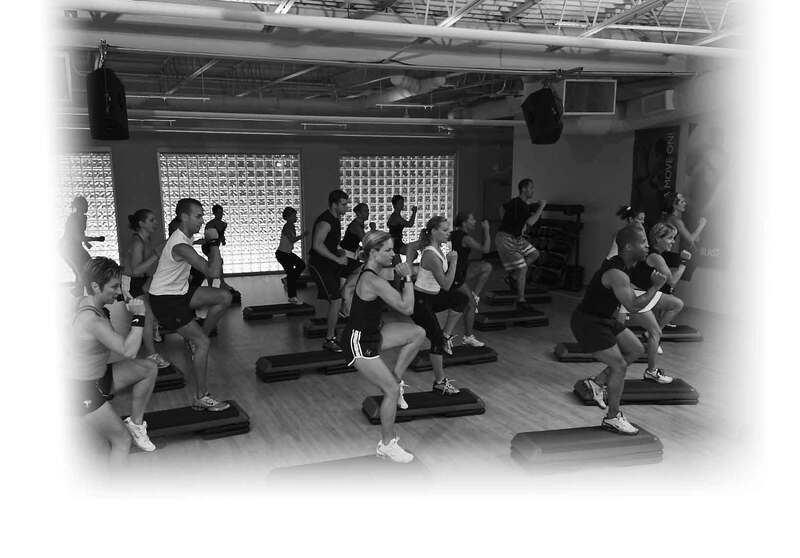 Licensed Group Fitness programs such as Spinning and Mossa guarantee the highest quality fitness experience. Looking to start a new exercise program? 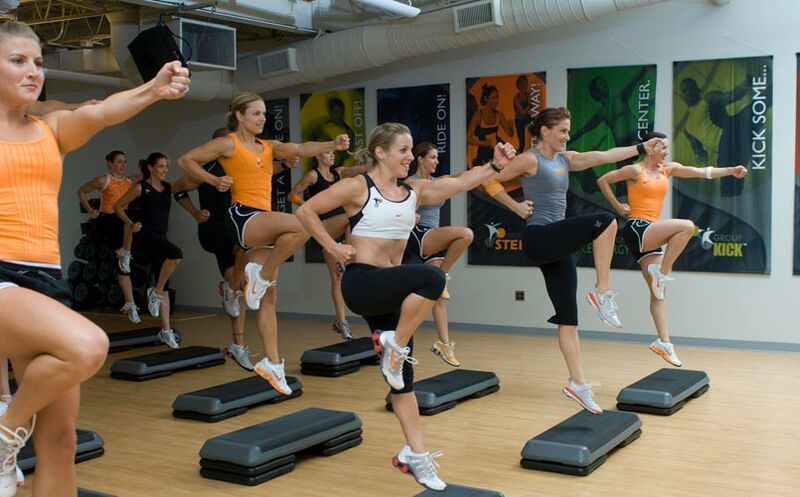 Group Active is the first class we recommend to our new members. Incorporating all elements of fitness: cardio, strength, balance, core and flexibility! You get bite-sized chunks of everything you need. Feeling healthy, more fit, stronger and more alive has never been more achievable or more enjoyable. Group Power is your hour of power! This barbell training program is set in an inspiring, motivating group environment with fantastic music and awesome instructors that will have you back into your "skinny" jeans in no time! If you are looking to build lean toned muscles and dream of tighter assets and sculpted, defined arms. Group Power is the class for you. Looking for peace of mind in a world where chaos seems to surround us at every turn? Center your energy with Group Centergy, an athletic, mind-body class with traditional yoga and Pilates movements set to uplifting music, fun group dynamics and supportive instructors. Enjoyed by both men and women, grow longer and stronger as you discover your inner "warrior". Light your internal fire in Salutations as you unearth your inner power, determination, commitment and dedication to your well-being. Release the stress of your day and allow your worries to dissipate with your breath. Group Kick brings it on! This electrified fusion class of several disciplines of martial arts, Muay Thai and boxing movements will kick your cardio to the next level while defining and shaping your body and building self confidence! Have you seen the physiques of boxers and kick boxers? Sculpted, shapely shoulders, powerful core and strong, toned legs� you get the picture! Energetic music gives you the strength you need, powerful, strong instructors challenge you to push your limits and keep punching, kicking and smiling! This mega calorie burning cardio class will change your mind about step classes forever as you realize the potential to change your body. Train like an athlete with simple yet powerful and effective movements using the step in different directions and at varying heights. Options are provided for all fitness levels. Strengthen and shape the lower body one step at a time. Lively music, full of life, and spunky instructors create this fantastic group experience. The Spinning program is the original and most popular group cycling class. And it's not just because Spinning is an unmatched way to make your fitness goals a reality. With no complicated moves to learn, top-notch instructors and music that begs your legs to pedal, getting into the best shape. The mission of Mossa is simple, to get more people moving! More than a catchy slogan it is a way of life we embrace. Group fitness classes are only as good as the programming behind them. The moves, the music, the instruction and entertainment are what keep our members coming back year after year. Each program is carefully designed to deliver a simple, fun and effective social exercise experience independent of gender, age or fitness level. Each program is professionally designed by Program Development Teams. Every quarter brings a new release for each program which is approved by Music Evaluators, Program Test Teams and our Mossa Safety Advisory Board. Testing takes place in over 100 classes six months before its official release to clubs and instructors. BodySchock Fitness is honored to be a part of the National Program Test Team and we actively participate to make the programs the very best they can be for our members. Once the clubs and instructors launch the new releases comprehensive surveys are completed to gain valuable feedback for future program improvement. This system ensures simple, fun and effective group fitness experiences to get more people moving. Mossa and BodySchock Fitness are dedicated to your success, and we pursue that goal with spirit and passion. Download a "Getting Started" guide for Group Active. View a class video teaser. Activate Your Life in only one hour! Feeling fitter, stronger and more alive has never been more achievable or more enjoyable! Incorporating all elements of fitness, Group Active will increase your cardio fitness, build your strength and improve your balance and flexibility, in a supportive group environment, with motivating music and caring instructors. Download a "Getting Started" guide for Group Power. Discover results, discover Group Power! Group Power is your hour of power! This 60 minute barbell program strengthens all your major muscles in an inspiring, motivating group environment with fantastic music and awesome instructors. With simple, athletic movements such as squats, lunges, presses and curls, Group Power is for all ages and fitness level. Download a "Getting Started" guide for Group Centergy. Redefine your self with Group Centergy. Grow longer and stronger as you explore this 60 minute journey of yoga and Pilates movements. Positive uplifting music, group dynamics and supportive instructors will enable you to center your energy, reduce stress and even smile. Download a "Getting Started" guide for Group Core. Train like an athlete in a 30 action=packed minutes. A strong core, from your shoulders to your hips, will improve your athletic performance, will help prevent back pain and give you ripped abs! Expert coaching and motivating music will guide you through functional and integrated exercises using your body weight, weight plates, a towel and a platform--all to challenge you like never before. Reach Your Peak with Group Core! Download a "Getting Started" guide for Group Fight. Group Fight will knock you out! Group Fight brings it on! This electric 60 minute fusion class of martial arts and boxing movements will kick your cardio to the next level while defining and shaping your body and self confidence! 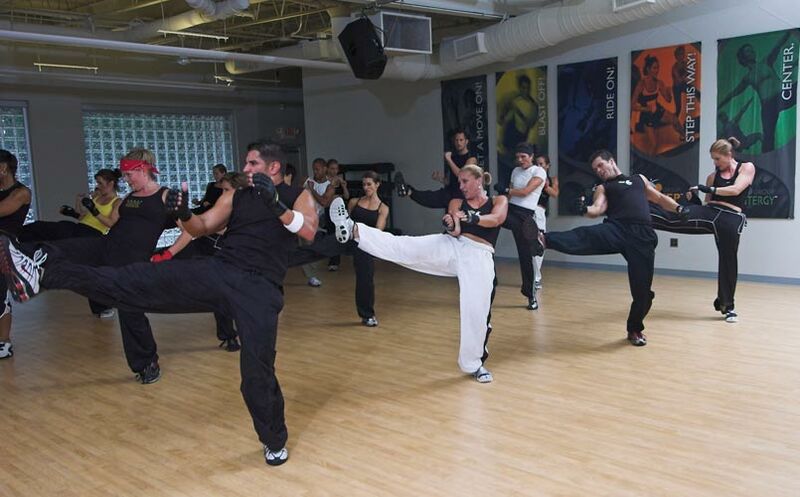 Energetic music, awesome instructors and an environment will keep you punching, kicking and smiling! Download a "Getting Started" guide for Group Step. Utilizing the step in many positions and heights, this compelling 60 minute cardio program stengthens and shapes the lower body one step at a time. Energetic music and motivating instructors create this spunky group experience. 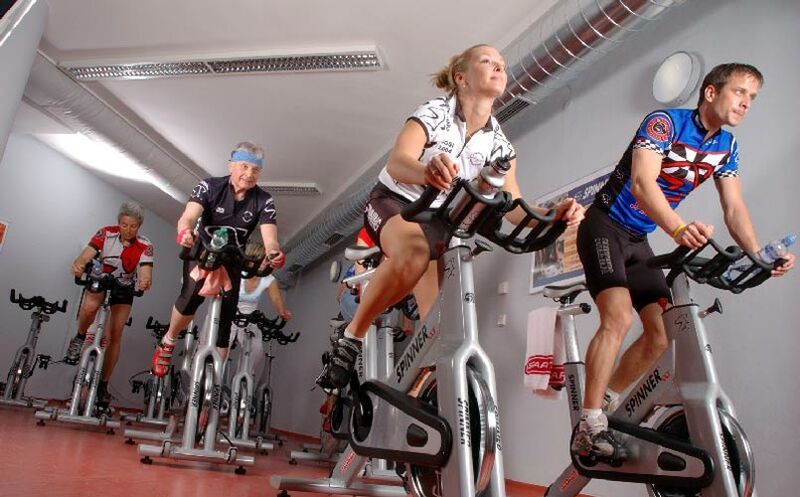 Experience the energy and excitement of Spinning class! 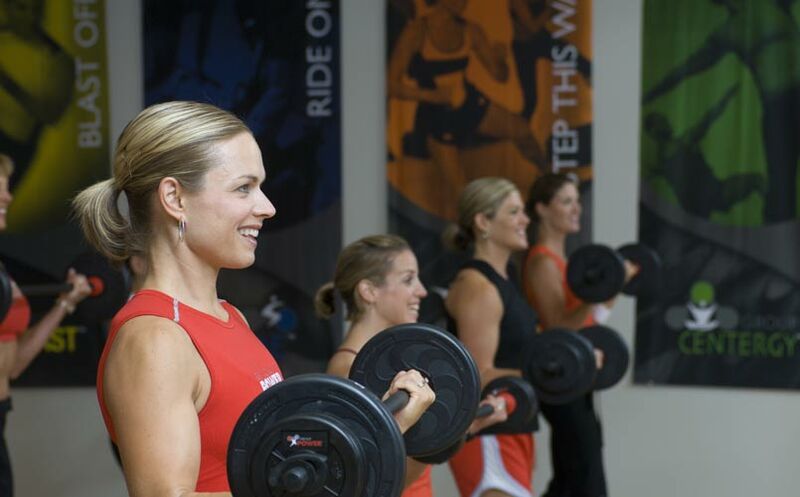 The Spinning program is the original and most popular group cycling class. And it's not just because Spinning is an unmatched way to make your fitness goals a reality. No complicated moves to learn, top-notch instructors and music that begs your legs to pedal, getting you into the best shape.